When an exception is thrown from a Main method and you don’t catch the exception within the Main method, the exception will be treated as an unhandled exception. Because the Main method is the entry point, or topmost method, of your application, there is no higher level method where the exception can be handled. When the unhandled exception occurs, the application will stop executing and display an error message. In the example below, we throw an exception of type ApplicationException from the Main method, but do not catch the exception in Main. 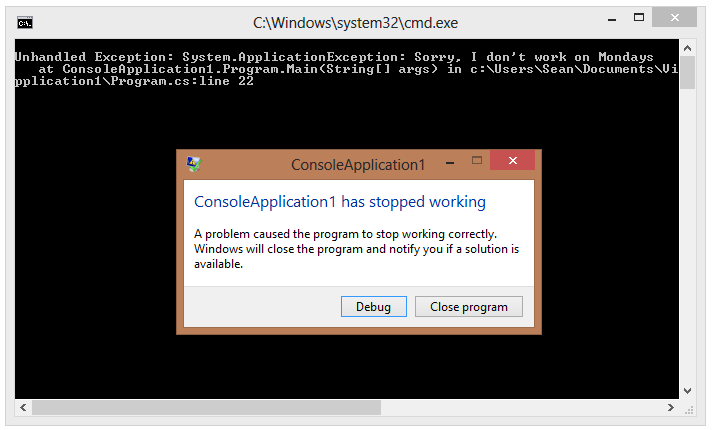 The exception is dumped to the console output and we see an error dialog. You typically have one class in your program that contains a function named Main, which acts as the entry point for the application. The entry point is the first method that will execute when you start your application. You can actually have more than one class that contains a Main method. If you do this, however, you must tell the compiler which class contains the Main that it should use as an entry point. You specify this in the project’s Properties window. 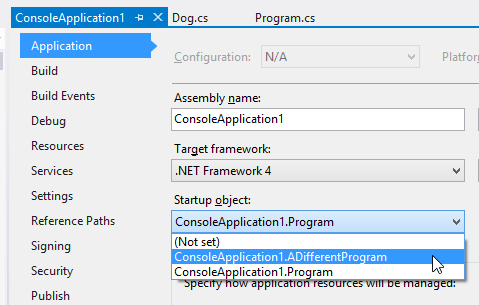 In The Smallest Possible C# Program, I mentioned a couple things as optional. For the record, here’s the absolute smallest C#.NET program that you can write. (Assuming that you don’t need it to actually do anything).